NTP stands for Network Time Protocol. NTP is an Internet protocol used to synchronise the clocks of computers to some time reference. Network time protocol plays an major role in various situations its very important and crucial below are few advantages of NTP. In this article we are going to see How to install and configure NTP server and Client in RHEL 7 / Centos 7. Stratum is used to synchronise the time with the server based on distance. Stratum-0 is a device which can’t be used in the network which is directly connected to NTP server. Stratum-1 will synchronise the time using GPS transmission, CDMA technology assume to be accurate or no delay associated with it. Local time update in NTP server we can make use of Stratum-0 and Stratum-1. 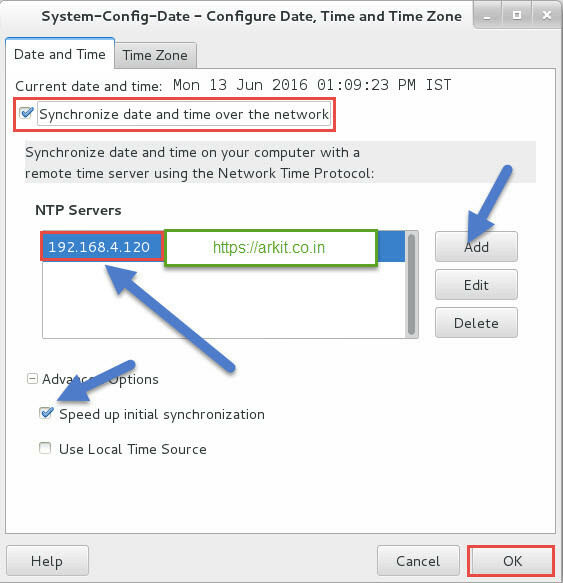 configuring NTP client to synchronize with NTP server. To enable time synchronisation between server and client we can make use of GUI interface as well as CLI interface. If NTP servers exists delete them and add your NTP server by clicking on “Add” button. Select “speed up initial synchronisation” then Click OK.
That’s from GUI interface your system is now NTP client. prefer: it specified that server is preferred over other servers. The configuration aspects in the article are fairly well done. However, I found the ntpd/chrony aspect confusingly handled. Both ntpd and chrony are software packages implementing the NTP protocol, and both can serve as an NTP client and NTP server. As such, I’m not sure why you elected to use ntpd for the server-side component, and chrony for the client-side. The RHEL/CentOS default time software with RHEL/CentOS 7 is chrony. Additionally, although both packages were used, the article didn’t make it clear that there were two different pieces of software being used, or explain why it was done that way. I understand your concern Christopher, I have added chrony client side configuration because some of the users they may not have GUI interface to do above steps. Ofcourse if you do from /etc/ntpd.conf OR /etc/chrony.conf are same. Under Allow NTP protocol to communicate with clients, you list this line for the firewall. Should it be udp instead of tcp?